Remember car camping with your family? Most of us have trucked a Volvo/Ford Explorer/Chevy Tahoe from the ’burbs to a designated parking space in the woods for a few nights of bug bites and bonding time. The EarthCruiser takes that idea way, way further off the grid. If you’ve heard of “overlanding,” you already get what the EarthCruiser is all about. If you haven’t- overlanding is car camping with more accessories and, ideally, a much more inconvenient destination requiring the use of said accessories. We’ve seen all kinds of overlanding setups over the years, from a bedroll in the back of a Geo Metro to a multi-million dollar big rig converted into a rolling luxury condo. The EarthCruiser is on the upper-end of that spectrum, but it’s built on basic bones. This six-ton vehicle is, simply, a 4WD Mitsubishi Fuso box truck. The cab is standard issue and so is its four-cylinder diesel engine. But instead of a cargo box full of blankets or radishes or frozen fish, a sturdy first-class domicile is mounted on the truck frame in which people can live self-sufficiently... indefinitely. I mean, except for the occasionally fuel-and-water resupply stops. 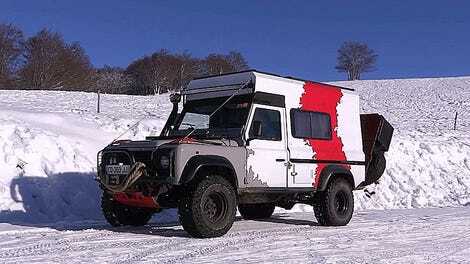 EarthCruiser is a small outfit out of Oregon, run by off-road adventure enthusiasts Lance Gillies and Michelle Boltz. Their team is turning these cargo trucks into extreme campers while they show their product off to the world. Literally. When we caught up with Lance and Michelle with their EarthCruiser in southern California, they’d just landed from cruising around Asia. The EarthCruiser can’t fly or float, but it can fit into a standard-sized shipping container, which is almost the same thing. The truck is a bit of a behemoth but really, not much harder to drive than a fully-loaded van or a U-Haul truck. As for actual off-road capability, the EarthCruiser might be sketchy over extremely technical terrain but it sure as hell would leave any regular van-based RV in the dust on fire roads or desert tracks. $200,000 buys a lot of hotel rooms or fuel for a smaller 4x4, but what makes the EarthCruiser cool is that you can post up in it anywhere, for as long as you want, and stay as comfortable as you’d be in your living room.